K-Tuned Tensioner - Pann Auto Performance - San Diego largest aftermarket automotive performance parts - What do you drive? The B-Series Timing Belt Tensioner was the very first part that ETD Racing, now K-Tuned, developed 10 years ago. The product was designed specifically for the Vibrant CRX which ran a successful B-Series engine program. Back then, we were a small race shop and we simply did not have the ability to bring the product to the performance aftermarket. Vibrant saw the design, and soon after a deal was made for them to sell the product under the Vibrant name. Very recently, Vibrant made the decision to discontinue this part and keep their focus on designing more turbo and fabrication related components. This opened up the door for us to reclaim the product and continue to offer it under the K-Tuned brand. At high RPM, the B-Series timing belt is known to flap excessively along the long front side. This unwanted excess slack in the belt makes skipping one or more teeth on the cam gears a definite possibility. A skipped tooth throws off the engine timing and the result is usually a simple loss in horsepower. However, in some cases, skipped timing can result in piston to valve contact which requires an engine rebuild to fix. This can all be prevented by installing the K-Tuned tensioner to properly support the front side of the timing belt. The unit bolts up directly to the stock Honda block and replaces the lower power steering bracket. Please note that the tensioner will only fit setups where the factory power steering system is deleted. K-Tuned Timing Belt Tensioners were given some minor cosmetic changes and revisions to bring them up to date and make them a little stronger than the original design. Back then, the top turbo cars were only making around 800whp. Fast forward 10 years, to 2015 and we are now seeing B-Series builds making close to double that power. All parts are CNC machined from 6061 billet aluminum, making them lightweight and very strong. The pulleys feature a special coating to reduce friction and prevent belt wear. 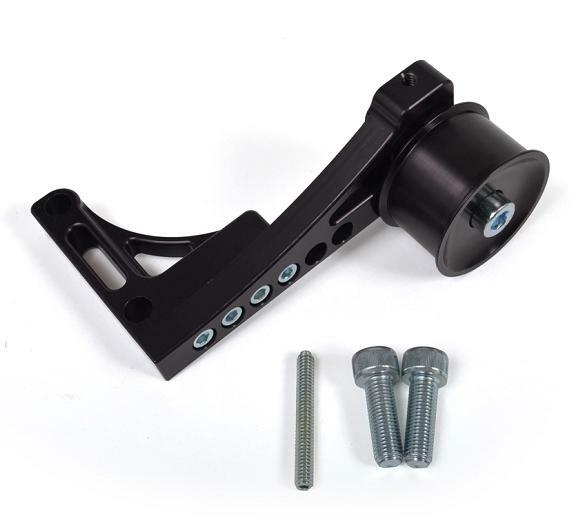 The tensioner is fully adjustable (both vertically and horizontally) and is available in your choice of anodized black or silver finish.